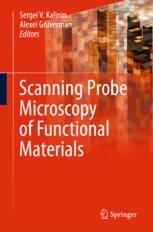 CICECO » Scanning Probe Microscopy of Functional Materials. Scanning Probe Microscopy of Functional Materials. abstract	 Novel scanning probe microscopy (SPM) techniques are used for the characterization of local materials functionalities ranging from chemical reactivity and composition to mechanical, electromechanical, and transport behaviors. In this comprehensive overview, special emphasis is placed on emerging applications of spectroscopic imaging and multifrequency SPM methods, thermomechanical characterization, ion-conductance microscopy, as well as combined SPM-mass spectrometry, SPM-patch clamp, and SPM-focused X-ray applications. 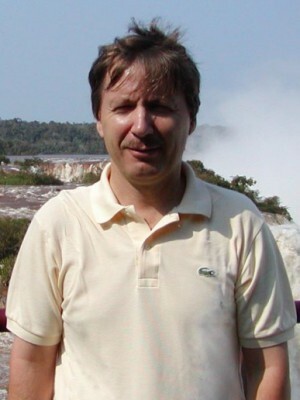 By bringing together critical reviews by leading researchers on the application of SPM to the nanoscale characterization of functional materials properties, Scanning Probe Microscopy of Functional Materials provides insight into fundamental and technological advances and future trends in key areas of nanoscience and nanotechnology. Key Features: •Serves the rapidly developing field of nanoscale characterization of functional materials properties •Covers electrical, electromechanical, magnetic, and chemical properties of diverse materials including complex oxides, biopolymers, and semiconductors •Focuses on recently emerging areas such as nanoscale chemical reactions, electromechanics, spin effects, and molecular vibrations •Combines theoretical aspects with applications ranging from fundamental physical studies to device characterizatio.